Don’t be stubborn in trading! 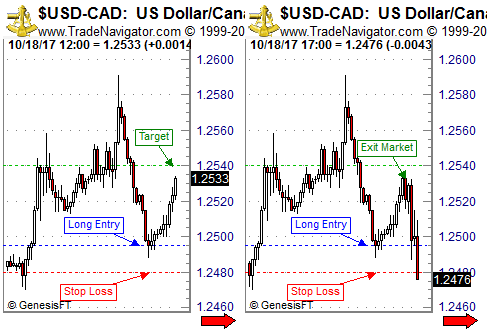 I recently found myself in a day trade in USD/CAD that I’d like to talk about. The exact reason for my entry actually doesn't matter for this article but the idea was to buy the pair at a support level where I expected it to at least temporarily bounce off nicely. The best case outcome for this trade was that it would hit my profit target that I had set shortly after the entry. It would give me a nice profit of more than two times my risk and I set it at a price where I was expecting the potential rally to run into sellers again. For sure I’ve been lucky with this one as shortly after the entry the market rallied nicely straight up for hours without any significant corrections. So the next morning (entry happened during the night) I was pleasantly surprised that USD/CAD was already approaching my profit target, see below on the first chart the market looked like at that point in time. USD/CAD was just about 7 pips short of reaching my profit target while my stop-loss was still at the initial stop loss level. I think I’ve read a similar story in one of the market wizards books, but in a summary, the situation was like this. The market was trading very close to my profit target that I had set because I expected sellers around that price level. At the same time, the trade could still turn into a full loss as I hadn’t moved my stop loss. So, in other words, the potential for further profits was just about 7 pips while my risk was about 53 pips! That’s when you simply cannot be stubborn in a discretionary trade, you got to act! As this had been such a nice, stress-free rally to that point and I’ve been already so close to the profit target I decided to simply take my money and run. I just got out at the market. If the profit target had been slightly further away I might have chosen another option. Go down to a lower timeframe and use a tight trailing stop to either get stopped out with a nice profit or have the market run into the profit target. On the right chart, you can see what happened after that. The rally fizzled and USD/CAD plummeted. So don’t be stubborn in trading!